Minutes after receiving the first print of Lady Liberty exclaiming "We Can Do It!" This afternoon I had the pleasure of speaking to a fairly sizable group of candidates. Wedged between Robert Butler and Kurt Hildebrand, I spoke on the topic of Reddit and other social media platforms. Reddit played a vital role in kick-starting my campaign; I want other candidates to know what a powerful resource it can be. 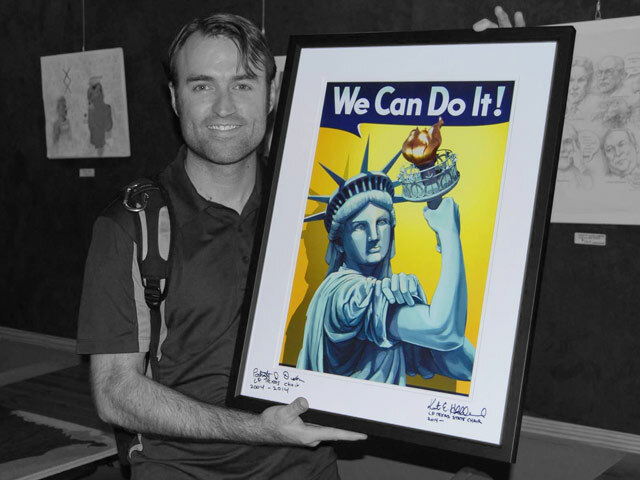 Following the meeting, the Kurt Hildebrand offered to donate the original print of the new Lady Liberty logo to anyone who was willing to commit to Gold donor status with the party. With all of the help I've been getting from people this race, I wanted to make sure I gave something back. Moreover, as a lover and collector of art, I thought this would make a great addition to my "political wall". I had the former chair of LPTexas, Pat Dixon, and the current chair, Kurt Hildebrand, both autograph it for me. If you'd like to get a copy of this print, they're available at the Libertarian Party of Texas website.